With tomorrow's preseason opener looming, today's rainy joint practice between the Patriots and Saints was unsurprisingly a low-intensity walkthrough. While it's hard to glean much of anything from that kind of session, Pats fans can take solace in the presence of two of yesterday's missing stars: Julian Edelman and Nate Solder. 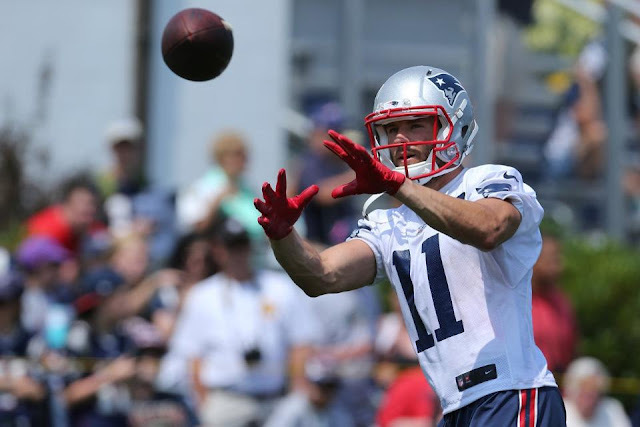 Edelman caused panic throughout New England yesterday after apparently re-aggravating his twice surgically repaired left foot and leaving practice. However, later reports indicated that he merely had a scare and no actual damage, structural or otherwise, occurred. According to the Herald, Edelman felt "numbness" in his foot, which is apparently common due to scar tissue shifting during recovery from that type of injury. Those reports were confirmed by Edelman's presence on the practice field today, where he took part in the early walk-through portion and ran routes before spending the rest of practice working on his conditioning with other injured players. It remains to be seen if Tom Brady's top target will be out there in team drills the next time the Pats practice at a higher intensity. It would be shocking if he's out there taking live reps in tomorrow's preseason game. However, his presence today indicates that he avoided any re-injury of his foot and is still on schedule to be good to go for Week One against the Cardinals. As for Solder, his absence yesterday was completely unexpected, as he hadn't suffered any noticeable injury during the previous day's session. His return today suggests that yesterday's absence wasn't injury related. He'll likely play tomorrow with the first team offensive line, which should give whoever starts at quarterback a higher comfort level in the pocket.